"The talks at camp reunion were on the Armour of God. We learnt about what it was and all the different parts of it. The activities we did were very fun, we went to jump lanes and went for a walk to the beach too. We played lots of games. We also had some craft activities. I most enjoyed the talks and seeing friends from the Summer camp the most . The crafts were also really fun"
Earlier in February, our minister Stephen was over helping out at Senior Camp Reunion (16+). The talks were given by Andy McKelvey, a medical doctor and deacon in Cullybackey RPC (the home congregation of Stornoway minister Stephen McCollum). What were the talks on? What was something that really stood out to you or made an impression from the talks? Emily: The talks mainly focused on body and soul and how they are integrated. Throughout the weekend Andy explored mental illness and the idea of us all being so dependent on other people throughout our whole life and how we should always be aware that even one simple conversation could be moving people towards or away from God. I found all the talks extremely interesting as nobody really talks much about mental illness, even though it was a bit different from usual talks. Eilidh: Over the weekend the focus of the talks were on body and soul. On Friday night the talk was on Humanity and what really stuck with me was that we are the image bearers, all of us, even from the womb and because we are made in God’s image we’re able to see the difference between right, and wrong. On the same night Andy spoke on suffering. He said that we all had faced suffering at least once and that as we get older we will experience much more, for example bereavement. In these times of suffering, no matter how painful God IS with us, and we depend on him to guide us in both the big things and the small things. Jess: The talks were focused on Body and Soul. I felt they were very different to our usual talks as Andy spoke about things that are very relevant in today’s society but stuff that isn’t really spoken about. It really helped that Andy explained how we should be with people with mental illness and how we should always go to them and speak to them and how they will push us away. One day we also heard how we should love all of those fellow Christians no matter what they’ve done and to always look out for each other. Also what he said about suffering – saying that all suffering has a purpose, and we might not ever know the true reason until we are in heaven and God reveals his plan to us. What were some of the activities you enjoyed from Camp Reunion? 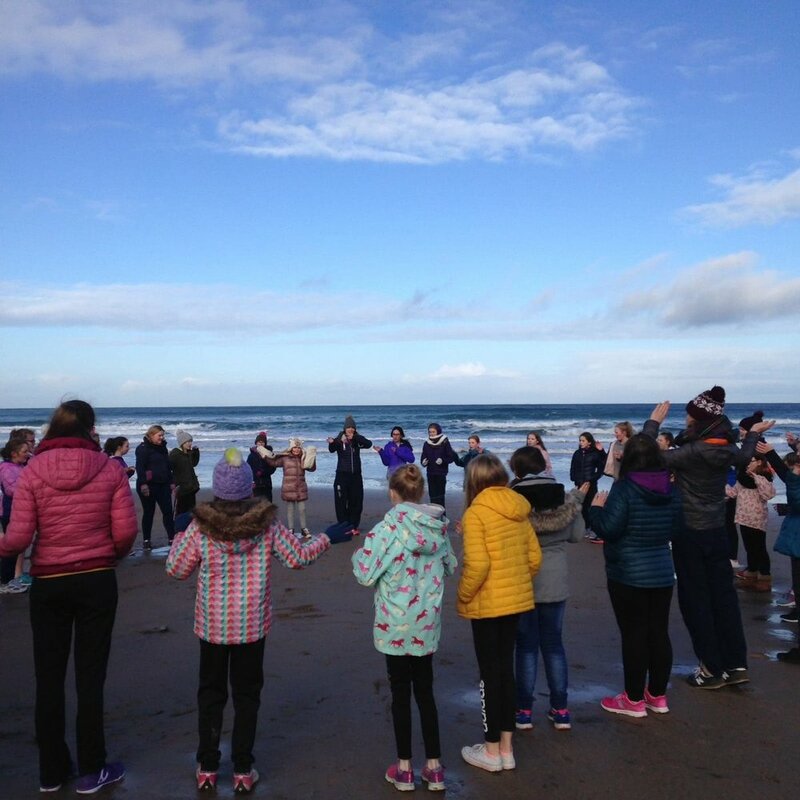 Emily: My favourite activity from camp reunion was the game in Portrush. We were given an ornament of a whale and had to trade it in different shops to see who could get something with the highest sentimental value. Our group managed to get a t-shirt with our picture printed on it saying “ Camp Reunion 2018”. It took some serious negotiation skills! Eilidh: On Saturday we drove down to Portrush. We did a trade for trade and my team ended up with two extra freebies!! It was a pretty gray day but had so much fun! Jess: I think I’ll just go with Emily on that one. We were in the same team except I got to keep the t-shirt!!! What was your favourite part about Camp Reunion? Emily: My favourite part of Camp Reunion was being able to have fellowship with other young people, learning more about such an interesting topic, and renewing friendships from camp in the summer. Roll on camp 2018! Eilidh: The highlight of reunion was definitely seeing everyone again and having fellowship together. It all passed SO quickly!! Can’t wait to see everyone again in the summer! Jess: My favourite thing about camp was definitely getting to catch up with everyone and speak to new people! My least favourite thing was how cold it was the first night! I went to bed with a jumper, hoodie, and jacket on as well as my towel!!! All because Eilidh forget to put the radiator on! Newer PostAre you being lied to?